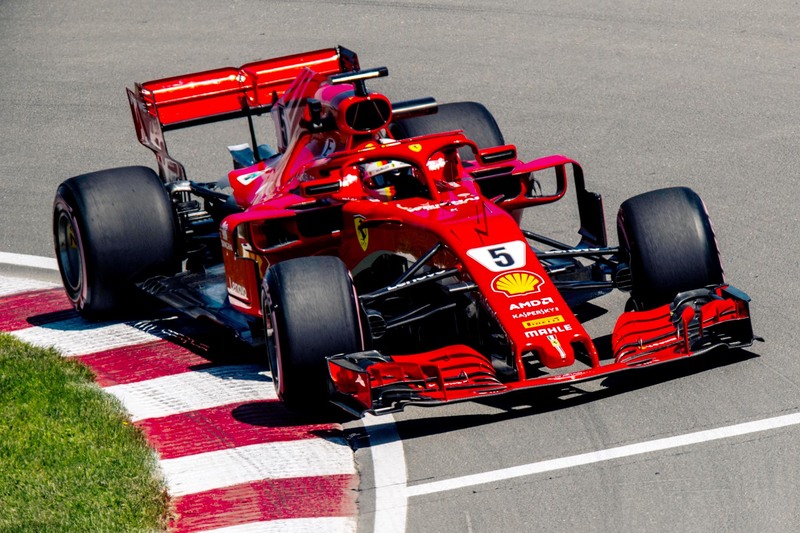 Sebastian Vettel has scored his fourth pole position of the season with a slick qualifying performance in Montreal. The German put his Ferrari on provisional pole, and though he marginally improved his time on his second run — to a one minutes 10.734 seconds — his first time would have been good enough to secure P1. It marked another strong turnaround for the team after a difficult Friday, and Vettel credited the team for enabling him to compete for the front row. “What a day!” he said. “The car was incredible in quali, it just kept getting quicker. “I think yesterday we were a bit in trouble. I wasn’t really happy with the car and I just couldn’t get a rhythm. “But today it switched on. I guess I woke up the right way! Valtteri Bottas qualified second despite failing to improve his first time on his second run and despite Mercedes not using an upgraded power unit for this race unlike its frontrunning rivals. Vettel’s Ferrari teammate, Kimi Raikkonen, could have jockeyed for the position had he not messed up on the exit of turn two, leaving the door open for Max Verstappen to qualify third for Red Bull Racing. “I’m very happy with this weekend so far,” said the Dutchman, who had endured stern scrutiny all weekend for his scruffy start to the season. “The car’s been working really well. Lewis Hamilton qualified fourth in the second Mercedes, keeping at by Raikkonen and Red Bull Racing’s Daniel Ricciardo. Renault was best of the rest with Nico Hulkenberg in seventh, 1.2 seconds off Vettel’s pole time. Force India’s Esteban Ocon followed, with Carlos Sainz and Sergio Perez in ninth and 10th. Ferrari and Mercedes set their fastest times on the ultrasoft tyres as opposed to the faster hypersoft compounds in preparation for the race. Sebastian Vettel, Kimi Raikkonen, Lewis Hamilton and Valtteri Bottas will all therefore start the race on the ultrasoft tyre in the hope of being able to make just one stop onto the supersoft compound, avoiding the delicate hypersoft completely. Red Bull Racing’s Daniel Ricciardo and Max Verstappen set the fastest times of the session with the hypersoft tyre, the Australian breaking the track record in the process. The top three teams were joined by both Renault and both Force India drivers, dropping Haas’s Kevin Magnussen into the knockout zone in 11th. Brendon Hartley put Toro Rosso’s upgraded Honda power unit to good use, qualifying just 0.029 seconds behind the Dane in 12th. The most significant surprise, however, is that Sauber’s Charles Leclerc managed to beat both McLaren drivers with a 0.2-second advantage in 13th. Fernando Alonso led the McLaren pair in his 300th grand prix start, with Stoffel Vandoorne trailing by 0.009 seconds. Romain Grosjean suffered an engine failure seconds after pulling out of his garage, eliminating himself in last immediately. The Frenchman’s Haas billowed thick white smoke down the pit lane, and though his engineers had him stop before the pit exit so that his car could be recovered to its garage, there was nothing that could be done in time to get him back out for the session in time. Sauber’s Marcus Ericsson qualified one spot ahead of the Frenchman, in P19, with suspension damage borne of a smack against the barriers part of the way through the session. Williams duo Sergey Sirotkin and Lance Stroll qualified 18th and 17th respectively behind Toro Rosso’s Pierre Gasly, who was nudged into the knockout zone by McLaren’s Fernando Alonso on a final hot lap.